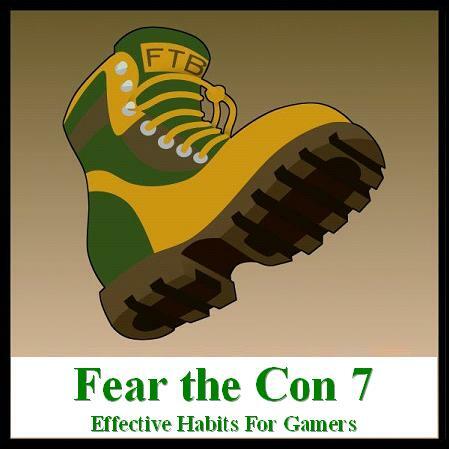 Caleb and I recently attended Fear the Con 7,(Thanks Fear the Boot!) running events, and promoting our work. It was a great con and we both had a blast there, but gaming conventions can be tricky for new game designers. For this episode, Caleb and I talk about our experiences at gaming cons and an aspiring professional should approach con work. Plus, we have an anecdote or two about the games we played and ran at FTC! Interesting episode. I did not expect the discussion regarding professionalism in a convention setting and how to handle confrontational attitudes or players, but it certainly makes sense. Just about every game I have run/participated in at a convention has had some type of player that can potentially derail/distract the game. My best practice: use a friendly “I” statement and return to the game. Hey Caleb, the guy who you showed what call of cuthulu is supposed to be was just on happy Jack’s rpg. And talked about your book and how he liked your scenarios. He is also from postcards from the dungeon. Also I just heard about this posthuman Mra stuff and I have to say I love that company more and more as time goes on. And by proxy your own stance on the issue. See Happy Jacks RPG Podcast, HJRP1207 Happy Jacks RPG Podcast Season 12 Episode 07 at http://www.happyjacks.org/hjrp1207/. Aw, man, that self-kidnapping plan in the Better Angels game is the best idea ever! Definitely something I’ll steal sometime. I had to look up what MRA was. It sounds like you guys have a lot to say on MRA and the wider implications of it and peoples reaction to it. I think it would make for a great regular episode podcast. A little risque but I think you guys could cover it maturely and intelligently. Good to see I wasn’t the only person who had to look MRA up. I agree: Magnetic Resonance Angiograms have no place in gaming. Hahaha the Gamer Ghetto is amazing. And when I first heard about the MRA and the Eclipse Phase forums, I honestly thought it was an epic attempt at organized trolling. Unfortunately, it is a real group. About the MRA podcast, I personally don’t want to see that. It’s the same thing about the anti-vaccine people, it’s just something I want to distance myself from. The idea for Ruin seems to be very very cool. I loved House of Leaves and I would like to see a good RPG take on it. The City of Masks game sounds interesting, but I’m not too into superhero powers. As long as the horror and madness can be turned up to eleven, though, I’d check it out. Also, what was the novella that Caleb wrote recently? I can’t decide whether MRA types coinciding with a subset of the transcendental transhumanist fandom is bizarrely ironic or tragically predictable. I think there’s a corner of the futurist crowd that’s very much about unacknowledge-edly reviling its own weakness, which is clearly what the whole operating budget of MRA types gets spent on. I hadn’t realized Posthuman had had to take a stand. very glad they did, though. those people are so awful. like Ross said…intolerance of the intolerant is not intolerant. life ain’t a game, and anyone who posits rules saying loathsome people need to be treated with the same decency that decent people do is just. wrong. the takeaway point for me as a fan is that if I ever do end up going to a con (which is up there on the unlikeliest things ever board), I shouldn’t seek out one of you two’s games, ’cause I’ll be sabotaging your attempts to market yourselves to people who don’t know you already XD if that sounds bitter, it isn’t meant that way. I’d like to see both of you live…comfortably, without becoming homeless or whatever and needing to record podcasts in the hole out back of the Ralph’s. it sounds like the best thing that can happen in a con game is getting six people who’ve never heard of you guys before together who all leave wanting to buy your books. on which topic, I’d read a Ross novel! or a Caleb novella? sounded like that was gonna be a Kickstarter reward somewhere? One other tip in addition to the good stuff here & on Ken & Robin’s podcast about professionalism, is bring extra stuff either for people to read if you have a few extra people show up attached to someone in the game who might want something to read or just in case the dice go flying through the room under some other table after a roll. Also mechanical pencils or a cheap box of pens with index cards also a good pick on light things to take. Glad to hear it went relatively well for both of you. Love the idea about the pirate box mobile server as a way to show off samples as I have half my game library on the tablet especially for source/core books so it’s a great way to reach out to those like me for mobile samples. And great idea on the self-kidnapping thing in Better Angels, once I start running & finding a group for Base Raiders I might throw that in a game either for the players to have fun with or a trap for them as they try to rescue people.